His arms are stunningly massive and measure 18 inches when flexed. 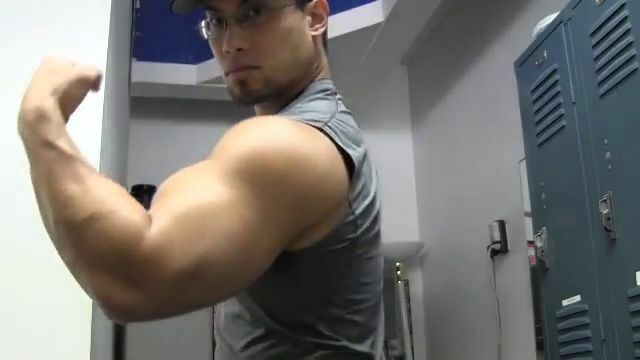 Tuan Tran, natural bodybuilder and raw powerlifter, demonstrates in two videos how to train for huge arms. 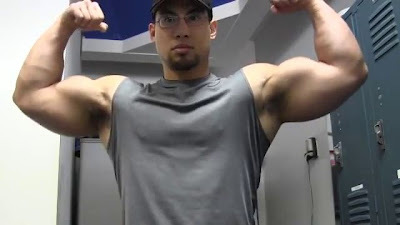 In the first video he explains several essential, very useful, and even surprising tips for better arm development. In the second video Tuan performs barbell curls for bigger arms: 10 sets, various weights, and various numbers of repetitions. New look, new approach, new items - and many new amazing fitness models: This is version 9 of AllAmericanGuys.com which has now been launched. The site proudly declares: "With the launch of version 9 we’re going to continue our tradition of bringing you the best fitness men on the planet, while trying out a new approach to our content delivery and providing you with more of what you want to see. We’ve taken into account many suggestions and feedback from our recent survey and we’re hoping you will enjoy the new version of AAG. We are going to focus on delivering more varied content and more frequent updates. One noticeable change you’ll see is the members’ section home page, where site updates will be delivered in a “blog format”, with more in-depth descriptions of updates, including photo features. In addition to the new look and feel, we’re also presenting a new approach to the delivery of our content. Our content is more organized, searchable and presented in a more vibrant way." There are many new items in version 9 of AllAmericanGuys: "First, we’re re-introducing the Photographer’s Showcase, a robust section which is going to allow many varied and talented artists to contribute content exclusively for AAG members. Second, a new section called Next AAG Star is being introduced that will allow you, the members, exclusive access to rate and decide who should appear next on All American Guys. Additionally, American Muscle is a section devoted to the followers of the bigger muscle guys of AAG. Heatseekers is getting it’s very own button, which means there will be more attention paid to this very popular showcase. All American Guys is now releasing all of it’s newer videos in three formats. We’ll continue to output HD and standard version Quicktime videos (that can be downloaded), Windows Media videos (also downloadable), and now streaming video which can be viewed on iPhones and similar hand held devices, including Ipads. We’re giving our members more options to view their favorite models’ videos and multimedia." New AAG models: Aaron Green & Jeremy Y. The full 40 minute Chest Workout awaits you at http://www.GregPlitt.com. 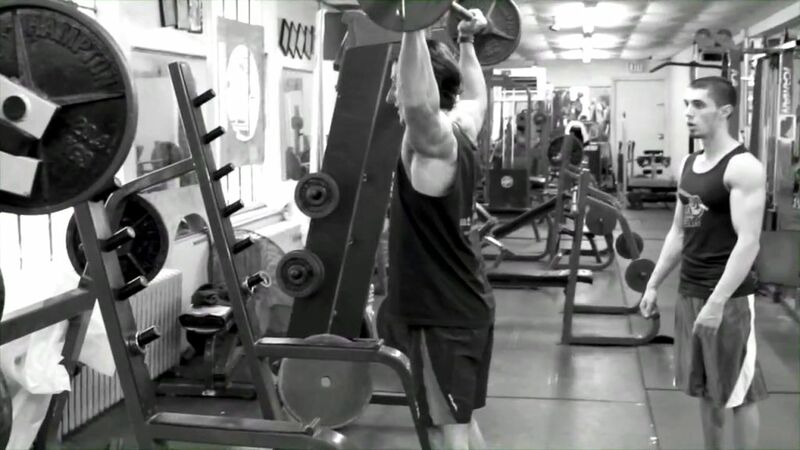 The GregPlitt.com Members Section contains 178 videos, including 52 instructional workout videos. $9.95 a month for full access. Every shot of him reflects his hard workout. Pavel Samek has built a highly imposing physique: serious muscle mass, striking definition, perfect symmetry. The competitive bodybuilder's training and contest preparation are documented in many new high quality galleries and videos here on CzechYoungMuscle. Aaron Green had a very atypical upbringing. He was born in Russia, moved to the USA when he was a child and grew up in Detroit, Michigan. Then in his late teens Aaron moved to Florida to start a new life and enjoy the warmer climate. He attended a military academy during his high school years and says it taught him how to be a better person. Aaron is very much into the outdoors and enjoys camping and going to the beach. He recently ventured into the world of modeling and is going to try his hand at acting eventually as well. You find many high quality photos and videos of Aaron Green here on AllAmericanGuys. Version 9 of AllAmericanGuys is now online. See the new look, approach, and items here on AAG. A toned physique needs a strong back. But a lot of people fail to work especially the lower back. Therefore fitness model and personal trainer Tyler Sarry recommends his exercise "Lower Back Extension on Ball". This exercise shows that you don't need a machine or a barbell to isolate and strengthen this body part. In the video Tyler demonstrates two variations - for beginners and advanced -, and explains in detail how to perform them effectively. 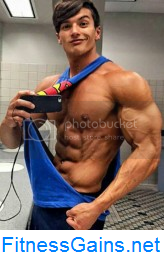 A bodybuilding competitor shows how he achieves his winning physique for the stage. Pavel Samek's imposing muscle mass, striking definition, and perfect symmetry are the result of his intense workout, proper nutrition, and disciplined lifestyle. His training and contest preparation is documented in many new high quality galleries and videos here on CzechYoungMuscle. Absolutely fit, and a great personality with numerous skills: Drake comes to AllAmericanGuys from the state of Louisiana. He's an outgoing, fun loving kinda guy who enjoys working out, modeling, swimming, watching movies, reading and just plain hanging out with friends. He's a dog trainer by profession but is looking to break into the modeling and acting fields. He loves the camera and enjoys traveling, so he figured - why not take his handsome looks and hard earned physique, and put them to good use. While he's considered "hot" by many, Drake is as humble as they get. You find many high quality photos and videos of Drake here on AllAmericanGuys. "Bodybuilding is my life", Pavel says enthusiastically. The effect of his passion, intense training, and disciplined lifestyle is evident: a physique with imposing muscle mass, striking definition, perfect symmetry. Pavel Samek, the new model on CzechYoungMuscle, has competed as a natural bodybuilder for several years. This year he has prepared for the Championship of the Czech Republic, his first contest with IFBB bodybuilders. Pavel is a personal trainer and nutrition coach. He likes music, chatting with friends, and muscle cars. You find many high quality photos and videos of Pavel Samek here on CzechYoungMuscle. Don’t look now but it’s almost swimsuit season. Are you ready to rock that speedo? Here are some tips to get you beach-ready. Here are some other tips to help you. 1. Mix it up. We all fall into the trap of doing the same thing over and over. Change your routine every four-to-six weeks. A little goes a long way. 2. Pressed for time? Try three 10-minute workouts spread throughout the day. It’s just as effective as a half-hour routine. 3. Let the sun shine in. Now that spring is in full bloom, why not complement your workout with a hike or brisk walk? You’ll alleviate boredom and get a head start on your tan. 4. Good deeds. Sign up for a 5K Race for your favorite cause. The objective isn’t to win, but to set a goal and have the discipline to complete it. 5. Retail therapy. Buy a swimsuit you’d like to be wearing by the start of summer. Leave it out in your kitchen or bedroom so it’s always visible. 6. Rise and shine. To boost your metabolism, exercise in the mornings. You’ll feel instantly energized, curb your appetite and burn more calories all day long. 7. And here are few extra special secret tips to try a few days before you "speedo up." These will help avoid bloating (caused by air or food in the digestive tract) and help you look buff, toned and totally hot. — Not using straws or chewing gum, which trap air. — Eating slowly because gulping food traps air. — Avoiding gas-producing foods such as beans and broccoli. — Drinking water and eating juicy fruits to clean out your system. — Skipping salty foods, which cause you to retain more water than the Hoover Dam. Have fun and see you on the beach! Ken Hunt is the owner of New York and Miami's Steel Gym, an AFI-certified trainer and a fitness expert. Ken’s expert advice has been featured in the New York Times, Compete, Horizon Barcelona, La Cosmopolatina, Men’s Fitness, DailyBurn, and SiriusXM and LA Talk Radio. He also travels around the country lecturing on physical fitness. He is currently finishing his new book, The Hunt for Fitness. He also hosts his own radio talk show, The Hunt for Fitness, on WWRL 1600 AM radio at 10 p.m. ET, every Friday. Under Ken’s management, Steel Gym has been named two years in a row the No. 1 gym in New York by the American Fitness Institute; two years in a row awarded the New York Award for Physical Fitness Facilities; has been named one of the Top 5 gyms in the US by Muscle & Fitness Magazine; and has been given the Talk of the Town Award three years in a row for Outstanding Customer Service. Steel Gym is located at 146 W. 23rd St. in Manhattan. 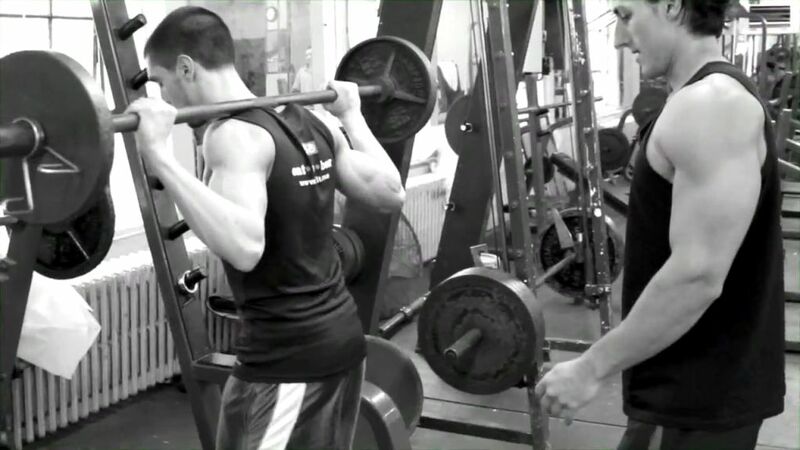 Call (212) 352-9876, e-mail info@SteelGym.com or log onto www.SteelGym.com for more information. Also, you can follow Steel Gym on Facebook.com/SteelGymNYC and Twitter.com/SteelGym. A men's physique competitor teams up with a teen bodybuilder for a workout session. In this video Sadik Hadzovic teaches Zach Linder a new compound movement, the combination of a barbell squat and a shoulder press.